Software engineers work in the Wayfair Lab. 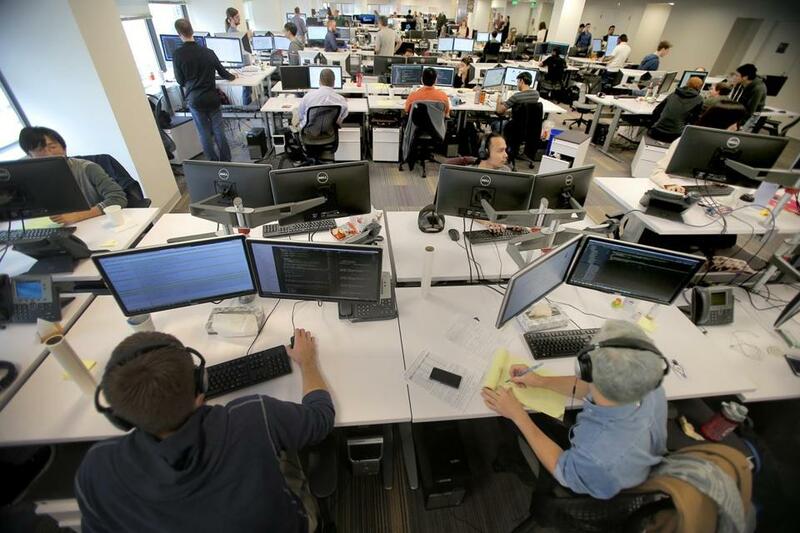 In preparation for hiring as many as 10,000 workers in the coming years, Internet retailer Wayfair Inc. is on a massive hunt for office space, an expansion that could make it one of Boston’s largest business tenants. The Boston-based company — which sells furniture and household goods — said Friday that it is looking for up to 1 million square feet of space, which is about three-quarters the size of the Prudential Center and nearly three times the room it has at its headquarters in Copley Place, where about 3,500 people work today. “At the rate we’re growing, we’ll need a lot more space,” said Wayfair spokeswoman Jane Carpenter. The company, which has hired real estate brokers and is negotiating with landlords, could cobble together that space through leases in several locations in Greater Boston and perhaps outside of Massachusetts, she said in an e-mail responding to questions from the Globe. Wayfair’s sales are rising rapidly, pushing revenue up 37 percent to $3.3 billion in the first nine months of the year. But the company has failed to turn a profit since it went public in 2014 as it spends to expand inventory, marketing, and distribution in the United States and Europe. Investors remain bullish, however, pushing its stock up almost 90 percent in 2017, in part on speculation that the company might be acquired by Walmart. Several real estate industry officials familiar with the company’s search say it appears focused on the Back Bay, where Wayfair was founded and has grown. Carpenter wouldn’t specify any locations, but one potential landing spot is the office complex at 500 Boylston and 222 Berkeley St., one block from Copley Square, which has about 475,000 square feet available. The real estate industry officials say Wayfair is negotiating with the building’s owner, Oxford Properties, but a deal has not been reached. Executives at Oxford did not return messages. There is a significant amount of office space available at neighboring 200 Berkeley St. — the Old John Hancock Building — and 200 Clarendon — originally known as the John Hancock Tower — where owner Boston Properties is reconfiguring lower floors to accommodate tech companies. Boston Properties is also planning a 26-story, 668,000 square-foot office tower along Stuart Street as part of a major development atop Back Bay Station, a project that won approval from the Boston Planning & Development Agency on Thursday. Wayfair’s growth in the Back Bay highlights the neighborhood’s evolution from an insurance-industry hub to a more tech-oriented business district, a trend that has happened even faster in the Financial District, said Brendan Carroll, director of intelligence at real estate firm Perry Brokerage. Companies like PayPal, Sonos, and CloudHealth Technologies have leased space in downtown towers as more traditional tenants scale back. A handful of even larger tech firms — Amazon in Fort Point, Akamai in Kendall Square — are rapidly growing large enough to take over entire buildings, once the provenance of big banks. Thus far, those winners include Wayfair. The company launched in 2002, when cofounders Niraj Shah and Steve Conine saw an opportunity to use Web search results and target marketing to help sell stereo racks and stands online. Shah and Conine went on to build more than 250 niche websites for other assorted housewares, like birdhouses and beanbag chairs, and in 2011 rolled all those sites into one online megastore they called Wayfair. Wayfair has made its name with free, fast, delivery of a wide range of home furnishings from more than 10,000 suppliers. It doesn’t have the massive distribution centers of online retail giant Amazon, but has opened about 15 warehouses across the country and invests heavily in marketing. The company added more than 800 jobs in the three months ending Sept. 30, giving it about 6,900 employees — roughly half in Boston and half at its distribution centers and international offices. They plan to accelerate that pace, chief financial officer Michael D. Fleisher told analysts earlier this month. Janelle Nanos of the Globe staff contributed to this report. Tim Logan can be reached at tim.logan@globe.com. Follow him on Twitter @bytimlogan.